I read this article and found it very interesting, thought it might be something for you. 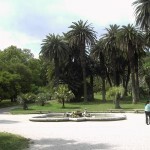 The article is called Gianicolo Park, Rome Travel Guide and is located at https://www.touritalynow.com/italy-travel-guide/rome/gianicolo-park. 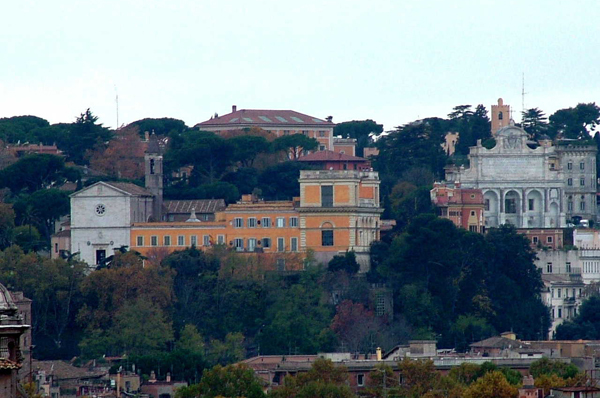 We always hear about the famed “Seven Hills of Rome” around which Ancient Rome was builr, but did you know that many locals consider there to be an eighth hill? 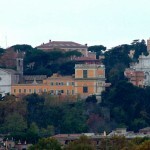 This is the Gianicolo or Janiculum Hill. It is located on the left bank of the Tiber River, and across from the historical center of Rome, in an area known as the Trastevere. The second-highest hill in Rome, it was once considered as the center for the cult of the Roman god Janus, the two-faced god of beginnings, transitions and ends, as well as the god of doorways. It is believed that Janus’ priests stood at the top of the hill to search for signs and auspices from the gods. During the second century, the time of Roman Emperors Aurelian and Probus, the Aurelian Walls were built in order to enclose the seven hills as well as all of the water mills that were used to grind Rome’s grain. They also included the Trastevere district which also had mills at the time. These days, Gianicolo is a favorite spot for people in Rome, both locals and tourists, who wish to get away from the bustle of the city for a short while. It is a large area which contains many points of interest, and is basically just a great spot to relax and catch some fresh air. One of the things that Gianicolo Hill is most known for is the grand, sweeping panorama of the city of Rome that it provides. Get your camera, and find a spot because you’re in for a treat. 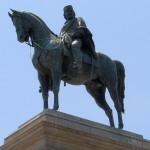 One of the most prominent sights on the Gianicolo would be a paved piazza that has a large equestrian statue of Giuseppe Garibaldi in its center. This is a monument to one of Italy’s national heroes who in 1849 held off a pivotal French offensive consisting of the French troops as well as the Papal army, right at the Gianicolo. At the time, Garibaldi was the general in charge of the Italian revolutionary army, and he and his allies played a large role in the unification of Italy, bringing it from a system of smaller city-states to a unified monarchy. 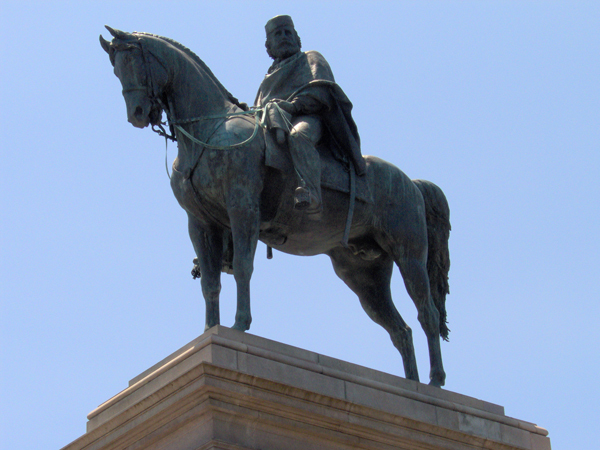 Designed by Emilio Gallori, the monument was built in 1895 and features Garibaldi on horseback, as well as four sculptures at the base of the pedestal which depict scenes of battle as well as allegorical situations. Meanwhile, 100 meters away and connected by a small boulevard is another monument, this time to Garibaldi’s Brazilian wife, Anita, who fought alongside him. Created by Mario Rutelli in 1932, she sits side-saddle on a horse in mid-leap, a pistol raised in the air and an infant clutched close to her. The pathway that connects her to her husband is the Viale aldo Fabrizi, and is lined with the busts of their fellow revolutionaries. 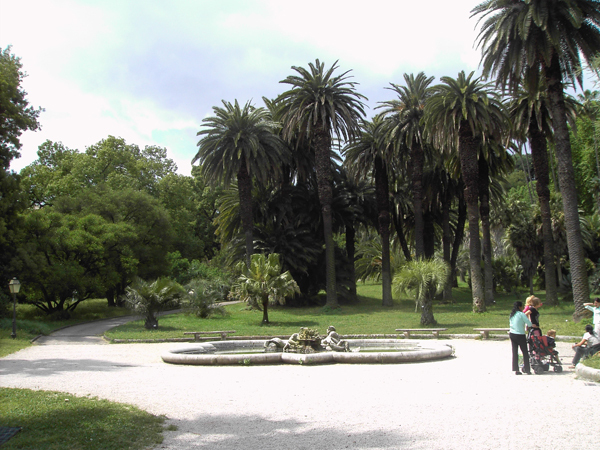 On the east side of Gianicolo Hill is the Botanical Gardens, or Orto Botanico. Originally the pope’s medicinal garden during the time of Pope Benedict VIII, it now belongs to the Sapienza University of Rome. This 30-acre piece of land now serves as home to an estimated 8000 species of tropical plants, trees, and flowers which delights locals and visitors every year. It also contains structures such as a 19th century greenhouse, two fountains, as well as a grand staircase. 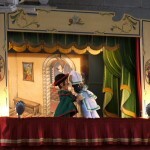 Bring the kids and keep an eye out, because just north of the Garibaldi monuments is the tiny stage of the Teatrino di Pulcinella al Gianicolo. 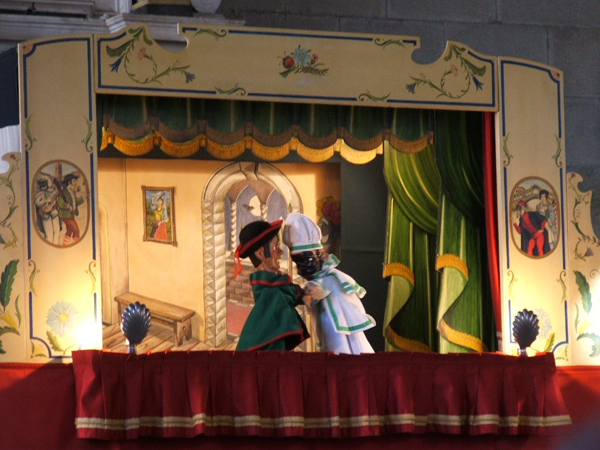 They are a group which performs open-air puppet shows using traditional Neapolitan hand-puppets known as Pulcinella. They perform free half-hour-long shows on Saturdays and Sundays, starting at 10:30 am to 1pm, and again at 4pm to 7pm. There is no charge, but donations are most definitely welcome. 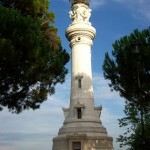 A short distance away from the Garibaldi monuments is another structure that is dedicated to honoring the memory of Italian Patriots who died between 1848 and 1870 in the Italian Independence Wars. It is a simple rectangular memorial with arches that is made of white marble, and at the top is inscribed the words “Roma o Morte” (“Rome or Death”). 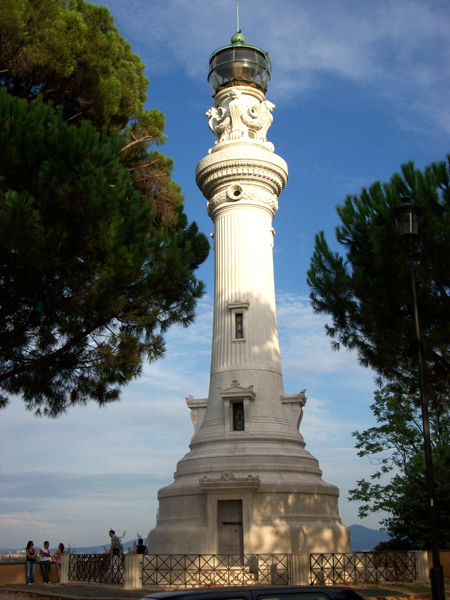 At the top of the Gianicolo is the Faro Al Gianicolo (Janiculum Lighthouse), which was built in 1911 by Manfredo Manfredi. As such, the lighthouse is also often referred to as the Manfredi Lighthouse. It was a gift by Italian immigrants in Argentina to their homeland’s capital. 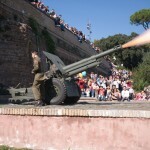 Every day at exactly noon, the famous cannon on Gianicolo Hill fires a blank shot in the direction of the Tiber. It is a tradition that dates back to 1847, when the cannon of the Castel Sant’Angelo gave the signal for the surrounding belltowers and churches to ring at exactly midday. The signal was used in order to avoid having the bells ring at various times since their clocks may be off by a few minutes. This ritual was transferred to the Gianicolo in 1904, and continued until 1939 when it was stopped due to the outbreak of war. 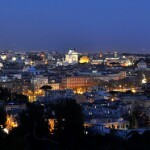 The practice was resumed 20 years later, in 1959 after a popular appeal to the Commune of Rome was passed. To this day, the firing of the cannon is still used as a method for Romans to synchronize their time. 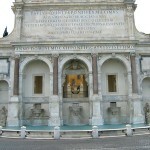 The Fontana dell’Acqua Paola is a massive baroque basin fountain located at the bottom of the park that was built in 1612 to commemorate the renovation and reopening of a first-century Roman aqueduct from the time of Emperor Trajan. 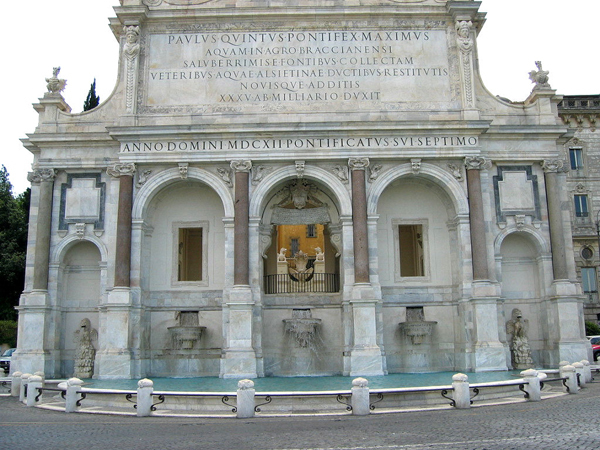 The fountain is named after Pope Paul V Borghese who commissioned it, and was designed by the Italian architects Flaminio Ponzio and Giovanni Fontana. 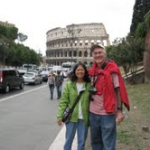 Unfortunately, the fountain was constructed using marble that was removed from the Roman Forum. This removal of materials resulted in the destruction of the ancient Temple of Minerva, which at that time was still intact. In present times, the Acqua Paola fountain remains an outlet for the aqueduct, and is also a popular backdrop for many newlyweds’ photos. 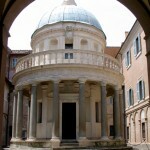 Near the Via Garibaldi and the Independence War Memorial is the Church of San Pietro in Montorio. It was built in 1481 as part of a convent complex. The church was constructed upon the request of the Spanish king Ferdinand II, who owned the property at the time. In one of the cloisters or courtyards of the church is a later structure, the Tempietto, which is a small circular sanctuary that stands on what was incorrectly considered as the exact spot where St. Peter was crucified. Based on the designs of the ancient temples of Vesta in Tivoli, it was built in 1502 by the Florentine architect Donato Bramante, the man who introduced the Renaissance style of building design to Rome, and who was the first architect of St. Peter’s Basilica. Inside the Tempietto is a small space with an altar which features the traditional upside-down cross, also known as the cross of St. Peter. Wear your comfiest shoes. While most of the area is a comfortable downhill walk, it still takes about an hour or so of walking if you mean to cross the park from one end to another. 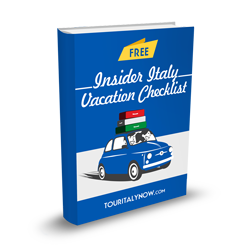 It will take even longer, depending on your pace, and if you want to check out the attractions. There are cafes and vendors in the park, so bring some small change with you in case you’d like to take a break on a park bench with a cold drink and a snack. When visiting the Botanical Garden, take note that it cannot be accessed from the Gianicolo, and visitors will have to use the main entrance on the east, at the foot of the hill near Palazzo Corsini. 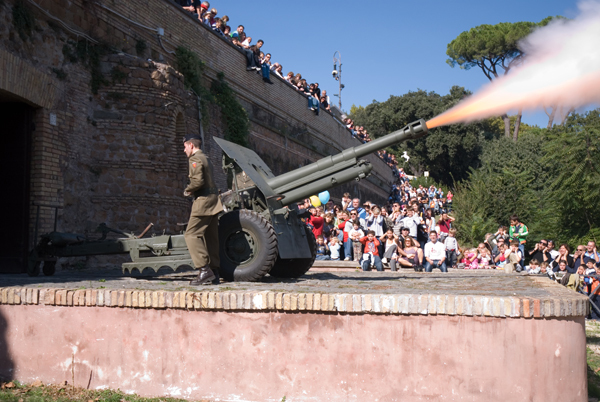 For those who wish to watch the firing of the Gianicolo cannon, it is located under the Piazzale Garibaldi. There is a nearby platform as well as a piazza/platform above it from which onlookers may watch the ritual. At around five minutes before noon, the cannon is brought out from storage, and an officer counts down the seconds until it is fired. Cover your ears because it’s going to be loud! 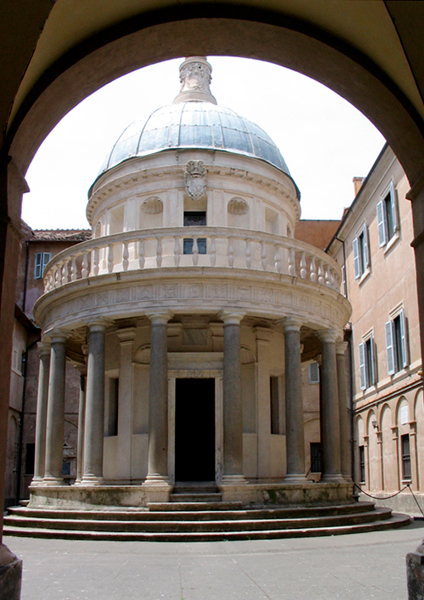 The Tempietto can be viewed from afar at any time, but for an up close look, visitors can drop by when the courtyard is open. This happens on Mondays to Fridays, from 8:30am to 12 pm, and again at 3pm to 4pm. On Saturdays and Sundays, it is open from 8:30am to 12pm.